This smoothie is a refreshing glass of sunshine. Sunshine that’s edible. 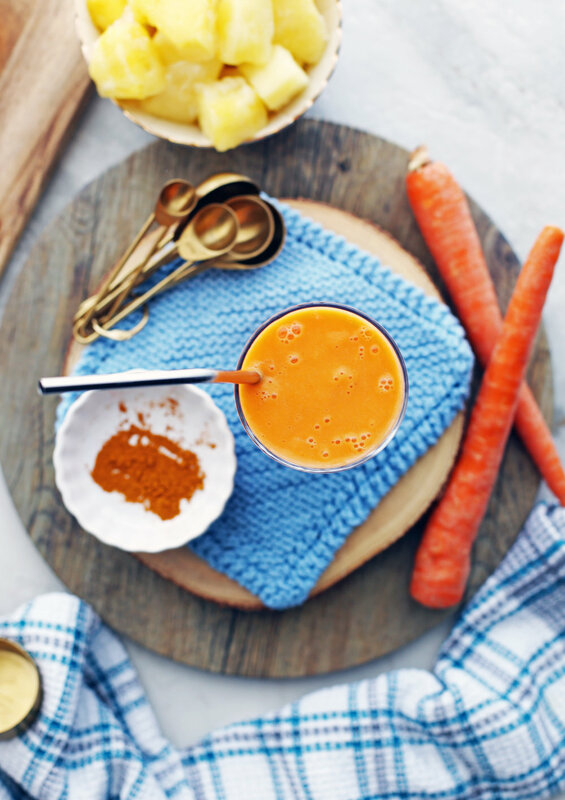 It’s a delicious and good-for-you concoction that’s primary sweet from the fruit with a hint of carrot and the antioxidant-rich spice, turmeric. 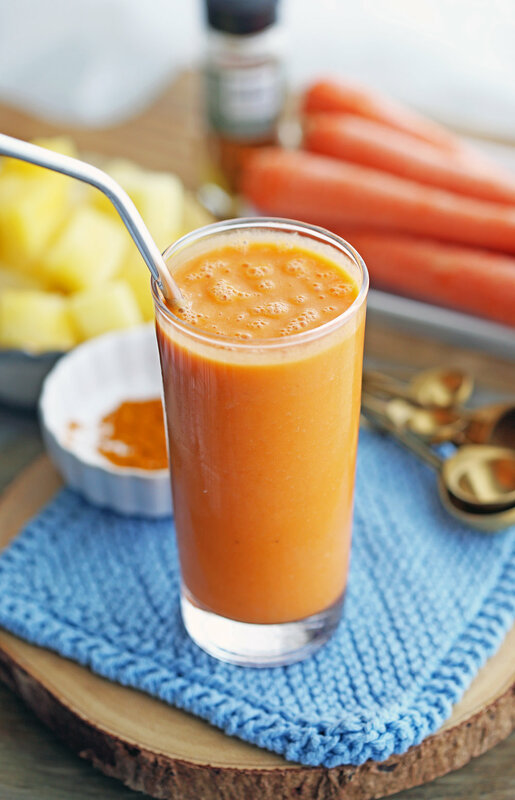 I hope you enjoy this easy drink recipe: Turmeric Pineapple Carrot Smoothies! 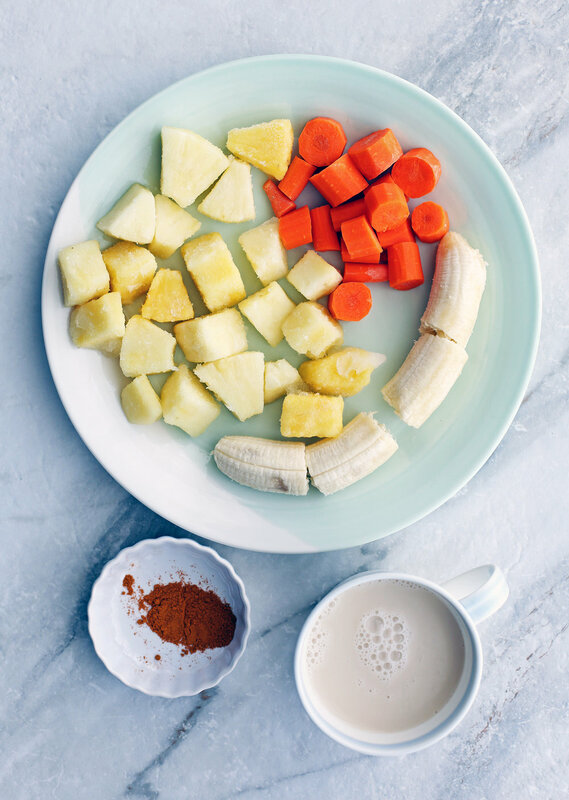 All the ingredients in this quick and easy smoothie recipe. Check out the recipe card below for the full ingredient amounts and instructions. All blended up into a tasty, creamy, and healthy drink. I may have gotten a little upset by this. Not only did I lose a drink, but clean-up was not fun. But hey, look at the lovely deep orange colour of the smoothie. Pineapple (fresh or frozen): This wonderful tropical fruit is full of sweet and tart flavours and full of healthy vitamins and minerals too such as vitamin C, vitamins B1 and B6, manganese, and dietary fiber. In this recipe, I used frozen sweet pineapple. I always pick up a bag of frozen pineapple from the supermarket to make smoothies. They are conveniently ripe and chopped up already, so I just need to toss them in the blender with the other ingredients. If you use fresh pineapple, choose the ones that are firm, smell sweet at the stem end, and is heavy for its size. Bananas (fresh or frozen): This inexpensive fruit adds more natural sweetness and helps give the smoothie that pleasing creamy texture. Plus, bananas are rich in fiber, antioxidants and nutrients such as potatassium, vitamin B6, and vitamin C.
I used a fresh ripe banana in this recipe, but you can use a frozen one if you have them saved up in your freezer. 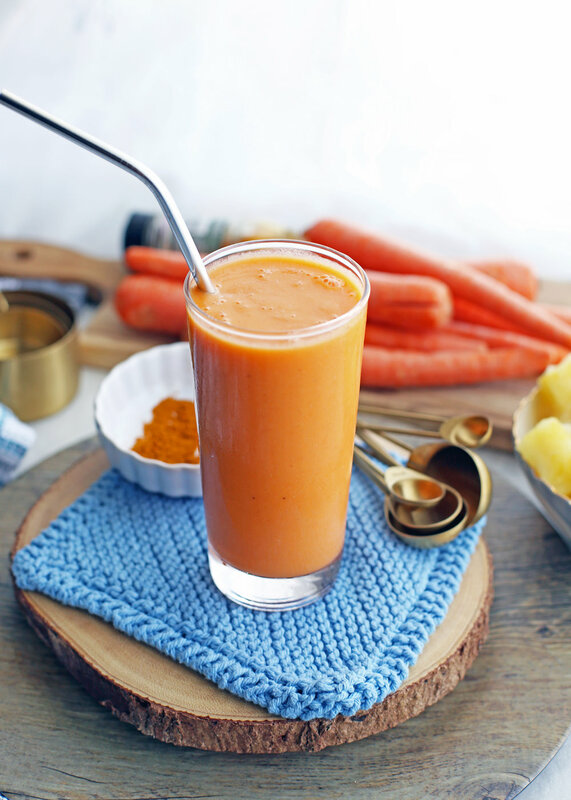 Carrots: I like hiding vegetables in my smoothies. 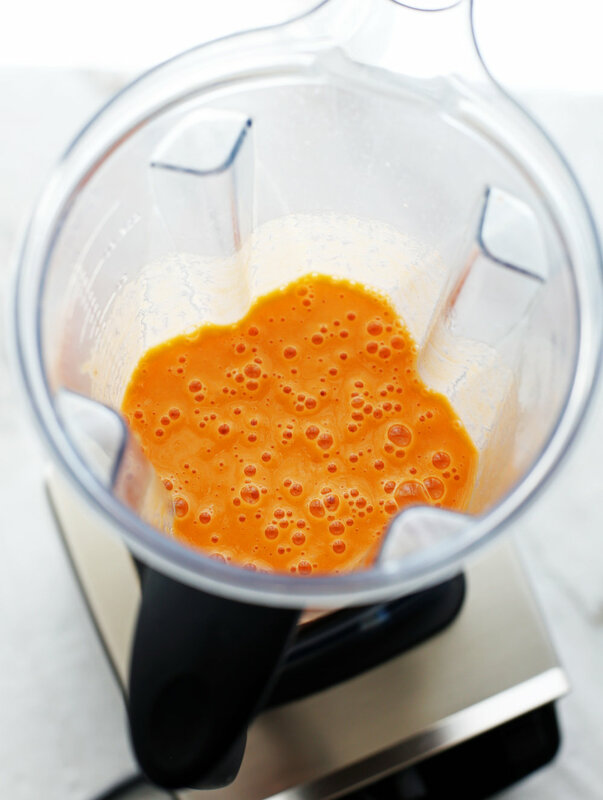 Usually, I like to stick fresh spinach or kale in my smoothies such as my recipe for Strawberry Avocado Green Smoothie, but I wanted to stick to the yellow and orange colours of the other ingredients so in went the carrots. Putting in greens would have made the smoothie a dull greyish colour, which would have tasted good, but not look as appetizing. Anyway, carrots are great for you. Not only are they found in abundance year-round at the supermarket, but they are healthy. For example, carrots are a rich source of beta-carotene (which converts into vitamin A), fiber, vitamin K, and potassium, which can help with lowering cholesterol levels and maintaining healthy vision. Vanilla Almond Milk: Lightly nutty with a hint of vanilla. This helps thin out the smoothie. I love the taste of almond milk (sweetened or unsweetened) so I tend to use it a lot in smoothies. Plus it’s dairy-free and vegan, making this smoothie accessible to more people. Of course, you can replace almond milk with another milk of your choice if you like. Ground Turmeric: This bright golden-yellow spice is lightly aromatic and has scents of orange or ginger that’s known for its antioxidant and anti-inflammatory properties. Plus, it’s high in iron and manganese. I used ground turmeric for my delicious breakfast or snack recipe for Vegan Turmeric Milk Chia Pudding. Ice: Only necessary if you are using both fresh pineapple and banana and you prefer a thicker texture. Delicious: It’s creamy and flavourful. Pretty: Such a beautiful orange colour. A quick, healthy breakfast or snack. Once blended, taste and adjust according to preferences such as adding more milk for a thinner smoothie or more pineapple or banana for additional sweetness.